At Brain Technologies, we view The Game as seriously as a heart attack. If you understand why, we think you will, too. As a rule, when we talk about The Game, we aren’t taking about things people do for fun (although playing The Game can often be part of the fun, too). In The Game, you work to get your desires and needs met. And that means going to, through, around or away from someone else who is trying to get his or her needs and desires met. So in life and at work, you are never very far from The Game. Because The Game is frequently about the need for conflict resolution. About dilemmas. About “damned if you do, damned if you don’t” entrapments. Sometimes very serious ones. The Game is about how people make things happen—or delay or prevent the building or making of them. About how wealth and power, access and opportunity, get boosted. Or rearranged. Or destroyed. This doesn’t necessarily mean The Game is always a contest or competition or conflict intended to produce winners and losers, although this is often the case. The Game can be played cooperatively, too. And many instances of The Game involve features of both. (Or, for that matter, neither.) 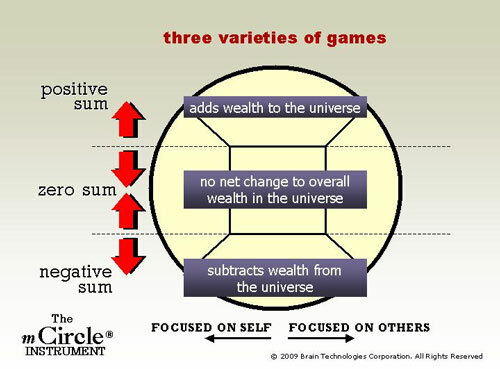 That’s why in discussing The Game, we often talk about positive sum, zero sum and negative sum outcomes. The Game can be complicated. It can, and often does, grow tangled and vexing very quickly. Sometimes, you can find yourself boxed into a corner, and it isn't worth the hassle it would require to participate further in The Game. So you toss in the towel—who cares? Other times, you may stand to lose something very dear in The Game—perhaps even your life. But you persist, because The Game affects so much and so many. Getting better and better at playing The Game is what becoming a wiser, savvier winner is all about. And helping you be more aware, proficient and more imaginative when playing The Game is the purpose of Brain Technologies’ The mCircle Instrument, a conflict style discovery and dilemma resolution tool that focuses on soft skills as well as more hard-edged ones. The “m” stands for “metanoics,” a Greek word meaning a change or shift of mind. Making smart, effective shifts of mind—shifts that reframe—when you are playing The Game is the straightest “brain training” path to becoming that wiser, savvier winner. And many of those shifts are soft skills shifts because they focus people's attention on getting everyone's needs met and dealing with feelings as well as hard facts..
Then, it will insist that you understand other important (reframing) moves you could make. Then, it will give you a powerful, Cliff Notes-like understanding of what the consequences are each time you choose (or decide by default) to use a particular “metanoics circle” strategy. Then, it will explain in detail the most powerful of the mCircle strategies and when it should and shouldn’t be used. And, finally, it will help you see why in love, the family, sports, business, politics and the all the other interactions of gods and humankind nothing matters more than how skilled you are at playing The Game. Which mCircle strategy is best for you? That’s your call. Which is usually how it is when it comes to deciding how wise and how savvy you want to be when it comes to winning at The Game. (Life, too!) But more often than not, the answer comes from skilled use of the soft skills for dealing with yourself and others, and that's the playing field for The Game where The mCircle Instrument has no peer. Order your copy (or several) now! How The mCircle Instrument works, what it does, how it delivers. Check out our training guides and audio-visuals for The mCircle Instrument. Copyright 2019 Brain Technologies Corporation. All rights reserved.